A high-flying City lawyer who resides in a 14th-century castle recently became the House of Lords’ newest hereditary peer. Charles Courtenay is a barrister in Latham & Watkins‘ London office and leads the US titan’s intellectual property practice. According to his firm profile, he studied history of art at Cambridge and spent eight years at Latham’s Los Angeles HQ before returning to the UK. What the online bio doesn’t tell you is that the 43-year-old is also the 19th Earl of Devon and was recently elected to the House of Lords. The Eton-educated lawyer, who inherited the earldom following the death of Lord Devon in 2015, won a crossbench hereditary peers’ by-election earlier this summer by 12 votes to five. Courtenay was among 19 aristocrats who put themselves forward following the retirement of independent crossbencher Earl Baldwin of Bewdley. Now, in an interview with The Telegraph (£), Courtenay has reflected on his life so far and the responsibilities that come with being the Lord of the manor — quite literally. 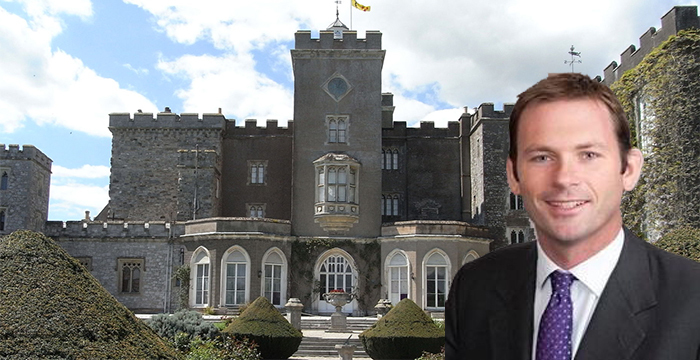 Courtenay splits his working week between Latham’s London office and Powderham Castle, the family’s 3,500-acre estate near Exmouth, Devon. Along with his wife Allison Joy, a former US actress who appeared in shows including Baywatch, the City lawyer has been managing the vast property since 2015.
never getting over @bbcradio1 #bigweekend thank you guys so much for having me and @kygomusic in Exeter. Hope to see u next year! Sunrise at @powderhamcastle – the fairy-tale home of the Earl and Countess of Devon, with its towers, turrets and acres of ancient parkland. Photograph by @harry.crowder. But the Latham lawyer is keen to keep Powderham open and hopes it will one day pay for itself. “Then we’ll be in a position to reinvest in pictures, and roofs… and all the rest,” he tells the newspaper. Courtenay completed his legal studies at the Inns of Court School of Law and was called to the to the bar by the Inner Temple. Prior to joining Latham, Courtenay was a member of 9 Old Square (now Maitland Chambers) where he remains a door tenant. The post Latham & Watkins London lawyer reveals double life as castle-living Lord appeared first on Legal Cheek.